I briefly met Donald Schmitt at a book signing back in 1996. He came across as a very sensible researcher who chose his words carefully. This decent approach to a study that has spanned decades shines through in this excellent book. It is measured in tone, and matter of fact in judgement. Yet, the subject matter could not be more sensational. Everyone knows about Roswell, and that is in no small part due to the endeavours of these two men, along with several other noted UFO researchers. So I don't need to re-hash the basic story. It's outlined in great detail in this book, along with a series of exciting new discoveries that add further weight to the extraterrestrial solution to the Roswell Incident. The fact that most of the unexpectedly large number of witnesses to this remarkable event have passed on is a double-edged sword for researchers. The pool of living witnesses is diminishing by the year, which should put Roswell into the shadows of history. However, the cover-up that evidently took place in New Mexico in 1947 had one design fault - threats against the living to keep silent about what they had seen - made by the agents of the U.S. Government - have a natural expiry date. Firstly, back in 1994 Air Force Secretary Widnall provided an amnesty for witnesses to speak out about what they saw. Secondly, everyone dies eventually, and there have been a rash of deathbed confessions about Roswell. The constant hounding and threats that some of the key witnesses report can have little bearing on someone who is about to die anyway. The confessions, often made to family members, resonate in their consistency - whatever it was that crashed, it was no weather balloon, and the implications of the discovery of the wreckage and the bodies was profound for all concerned. Notably, published in this book for the first time, is a signed affidavit by Walter Haut, the publicity officer at RAAF, released to Carey and Schmitt posthumously. It succinctly encapsulates what we have come to know over the years - that a flying saucer crashed in the desert near to the world's only atomic bomber airfield. There are times when only books are capable of putting across the whole story, in a way that a documentary on television cannot. There is simply too much evidence about Roswell for an hour-long programme to do justice to. It is the consistency and breadth of that evidence that really convinces you that an historic event occurred in the desert, and was subsequently covered up with a relish that nowadays would constitute a deplorable disregard for human rights. The Roswell 'minders' who made death threats against so many of the witnesses and their families behaved like mafia bully-boys. It is staggering that this behaviour - which was effective for several decades - was enacted by the same honourable men who helped defeat the Nazis. An irony indeed. But, time has passed, and the silenced witnesses have eventually spoken: The authors have been in contact with over 600 direct and indirect witnesses! This book provides a tsunami of testimony. You are left with only one conclusion - the debunkers are wrong. I also learned from this book that the army air force was still mopping up the site over two years after the crash. They regularly, and surreptitiously, sent teams of men to the three sites where the scattered wreckage was found, to scour the scrub plains for any tiny fragments of the foil-like 'memory metal' that might remain. It is little wonder that none has survived in the public domain. But there is always the hope that a shred of the physical evidence will one day emerge - and there are tantalizing tales in the book of the fish that got away. It certainly appears that the properties of this metal became a focus for projects at the Batelle Institute in Ohio, as described by researcher Anthony Bragalia, whose paper is published as an appendix. This magnificent book also features items by Edgar Mitchell and George Noory. They also sense that a barrier to acceptance is overcome by any sensible reader of the book. There is simply too much good evidence to ignore. 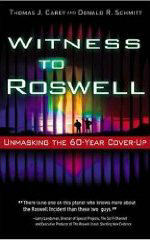 If I were to recommend just one book to read about the incredible incident of 1947, 'Witness to Roswell' is the one. Subtitled "Unmasking the Government's Biggest Cover-Up"